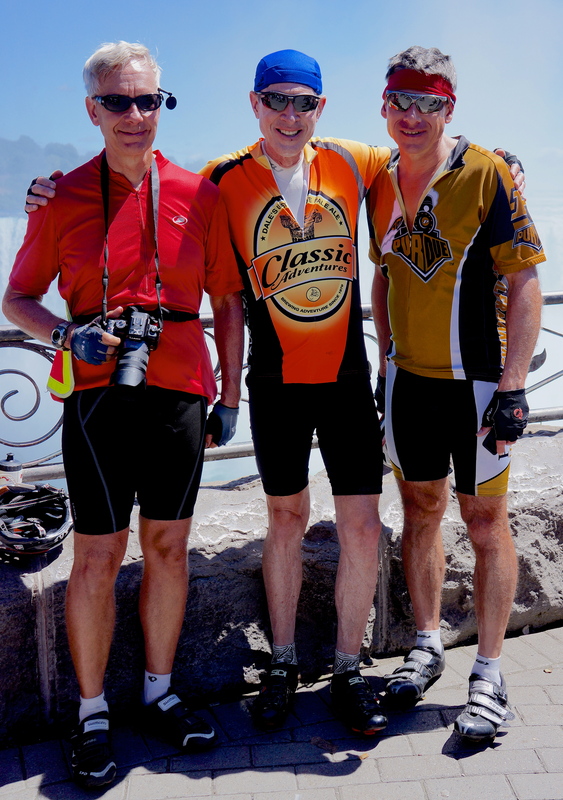 Mile 58: Jim, Robert, and Doug at Niagara Falls, Canada. Today was the most perfect day for biking of the entire tour so far – sunshine, low-mid 70s, low humidity. We could not have had a better day for seeing Niagara Falls. The roads were good for biking (actually better than much of the bike paths on the route so we often biked the roads) and we had minimal riding through unsightly areas of Buffalo. 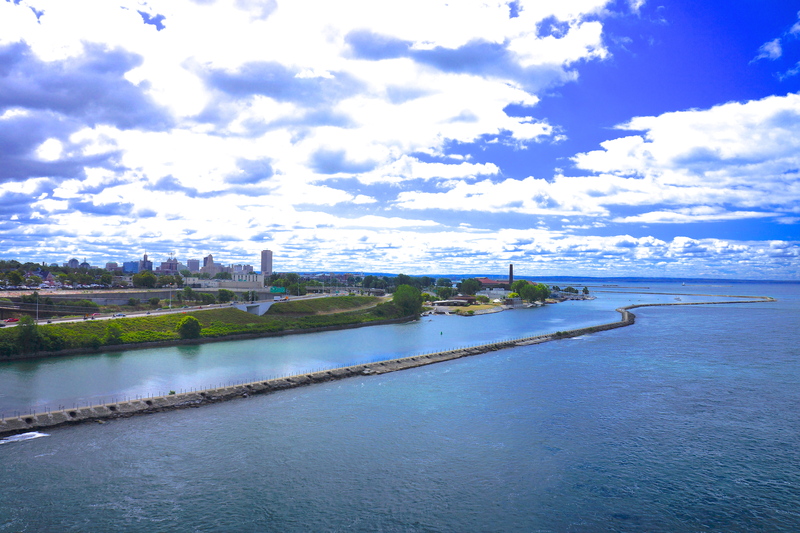 While riding into Canada on the Peace Bridge was easy and quick, the return to the US via the Queenston Bridge required us to wait in line (mostly in the sun and exhaust fumes) for about 45 minutes with hundreds of cars and trucks. 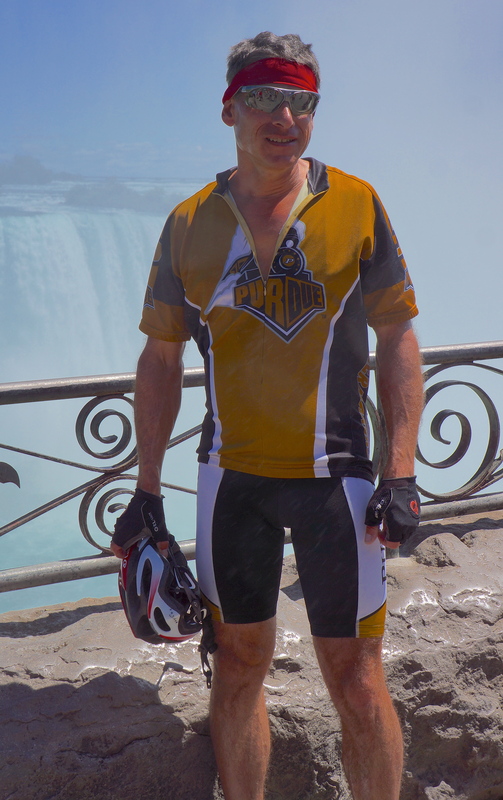 I almost forgot a milestone today – I biked the entire day with Doug, Jim, and Robert and even led the group for part of the ride. This is quite a change from a month ago. I can clearly tell that I am a stronger rider every day. Our evening was spent in Lewiston, NY. 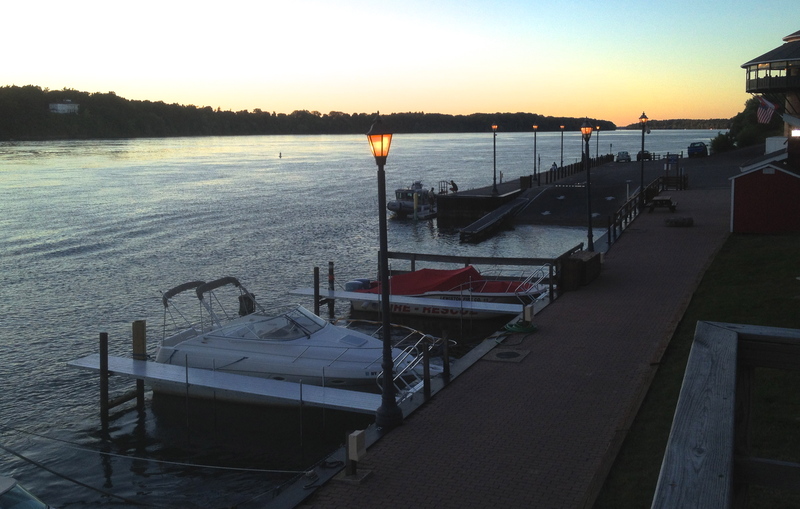 After dinner at Maci’s Italian Restaurant, I decided to walk the town and relish the beautiful evening weather – glad I did. As I walked into this quaint town I heard music. There was a concert in the town square with hundred of people in lawn chairs enjoying it as they sipped their wine. Further along there was a restaurant with a solo artist playing guitar and singing smooth jazz to a small crowd. 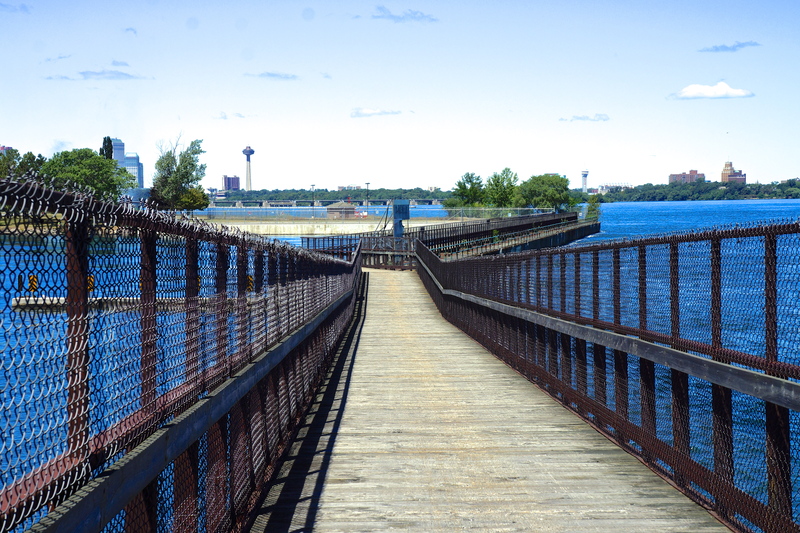 As I reached the Niagara River waterfront in Lewiston it was buzzing with activity. I again heard music (this time rock & roll) coming from one of the many restaurants there, the ice cream palor was packed, and the walking path full of couples. A nice way to end the day. 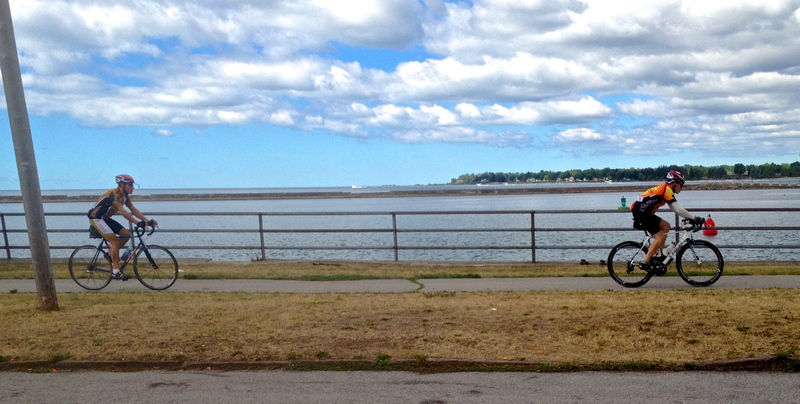 Mile 13: This is a view of Buffalo from Old Lake Shore Drive near Hamburg, NY. While the straight line distance to Buffalo was about 15 miles, it took us 30 miles to bike to it. Mile 38: Robert and Doug biking along Amvets Drive pathway in Buffalo (taken with my iPhone as I was riding on the road). Mile 40: View of Buffalo from the Peace Bridge to Canada. 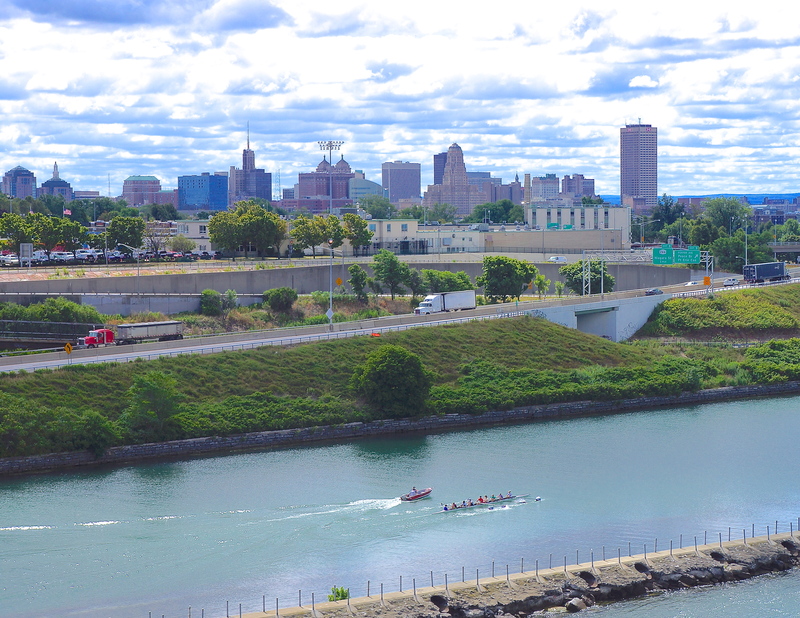 Mile 41: Another view of Buffalo from the Peace Bridge to Canada. 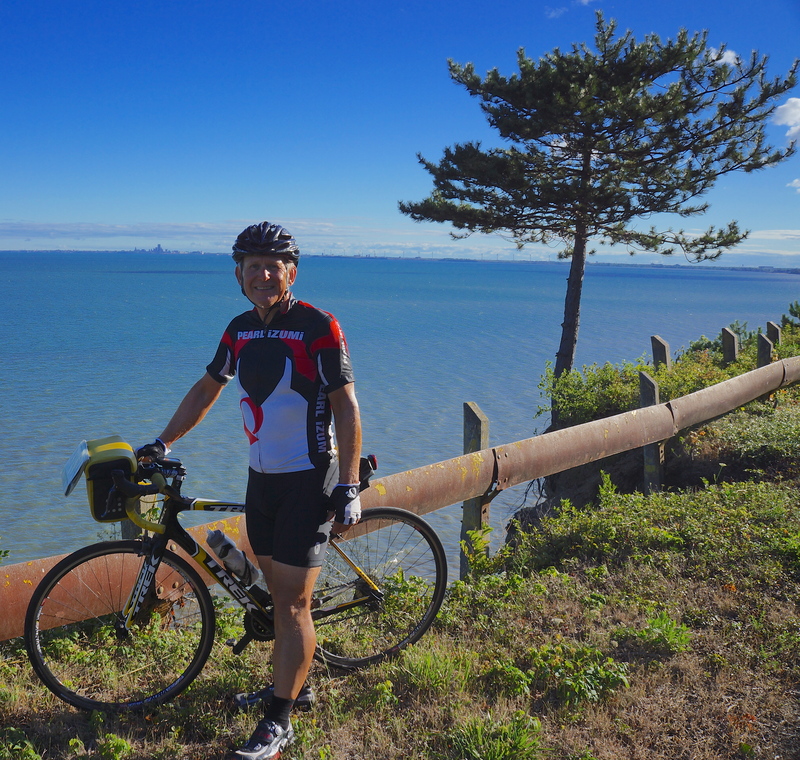 Mile 56: Approaching Niagara Falls on the Niagara Recreational Trail. Mile 57: View of the city of Niagara Falls, Canada from the Niagara Recreational Trail. 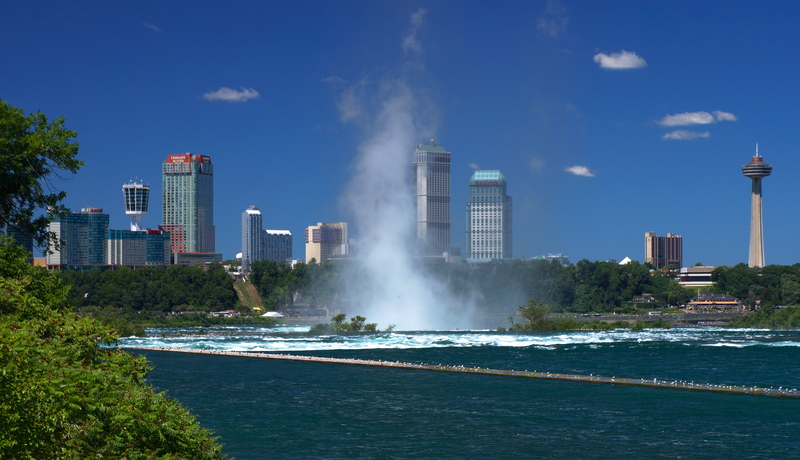 You can see the rapids building just prior to Niagara Falls and the mist being generated by the Falls. 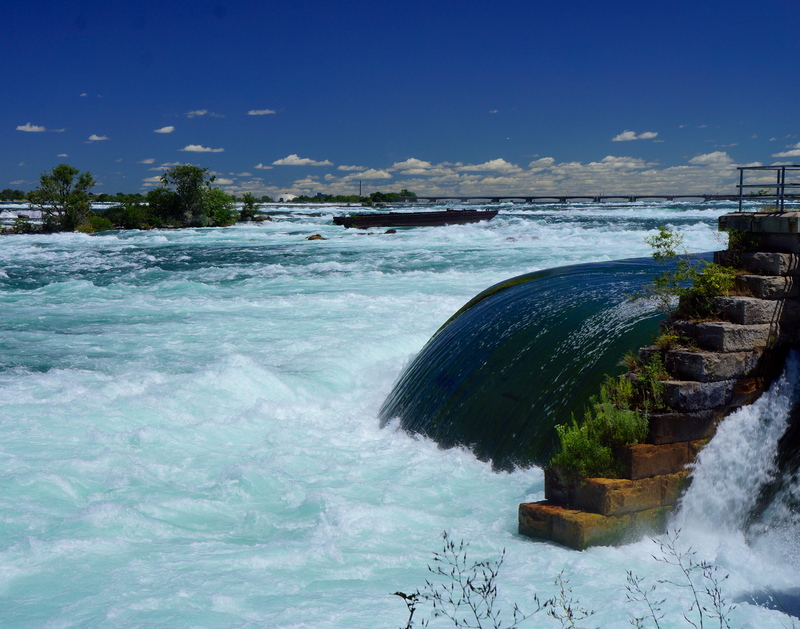 Mile 57: Another view of the rapids just prior to Niagara Falls. Amazingly, the steel boat stranded directly in the center of the photo has been there since 1918 when the sailors who were rescued grounded it. Mile 58: View from the Canadian side of the American Falls (US) left and Horseshoe Falls (Canada) right making up two of the three falls of Niagara Falls. 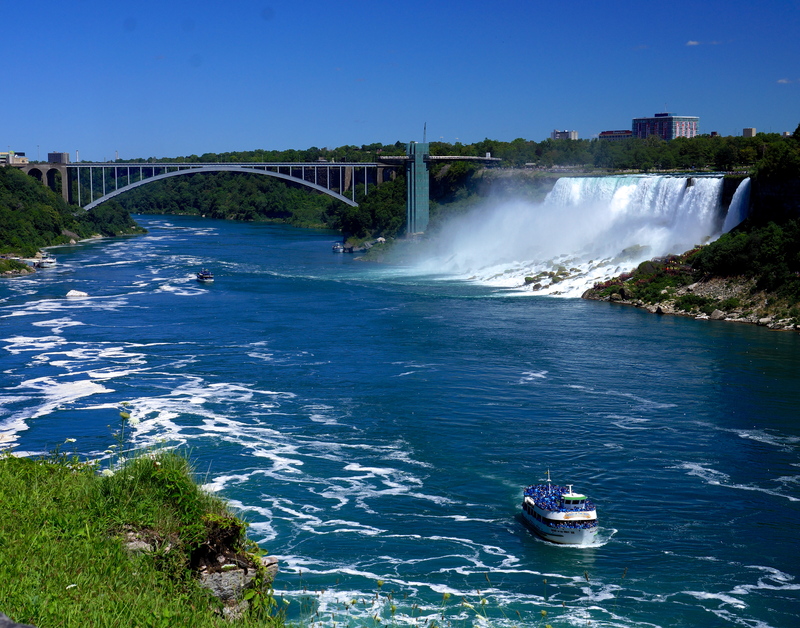 Mile 58: View of Bridal Veil Falls and the American Falls, two of the three falls that make up Niagara Falls with the US lookout site in the center. 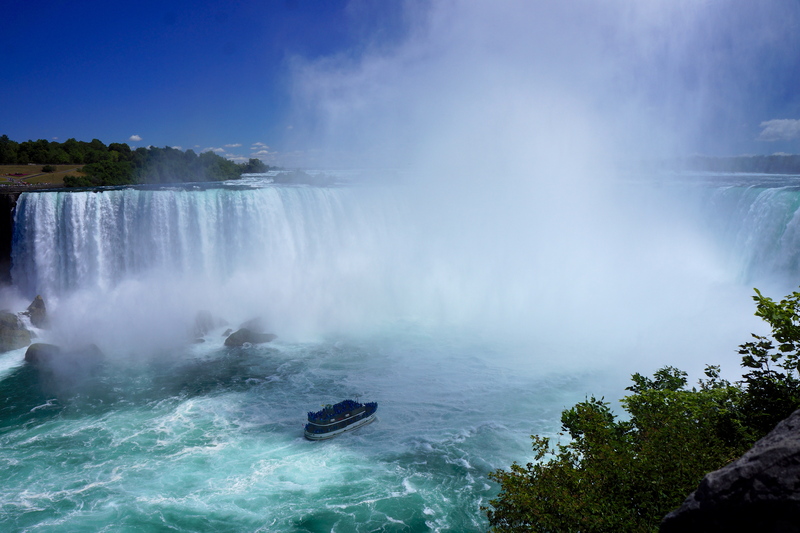 Mile 58: Photo documenting my visit to Niagara Falls. 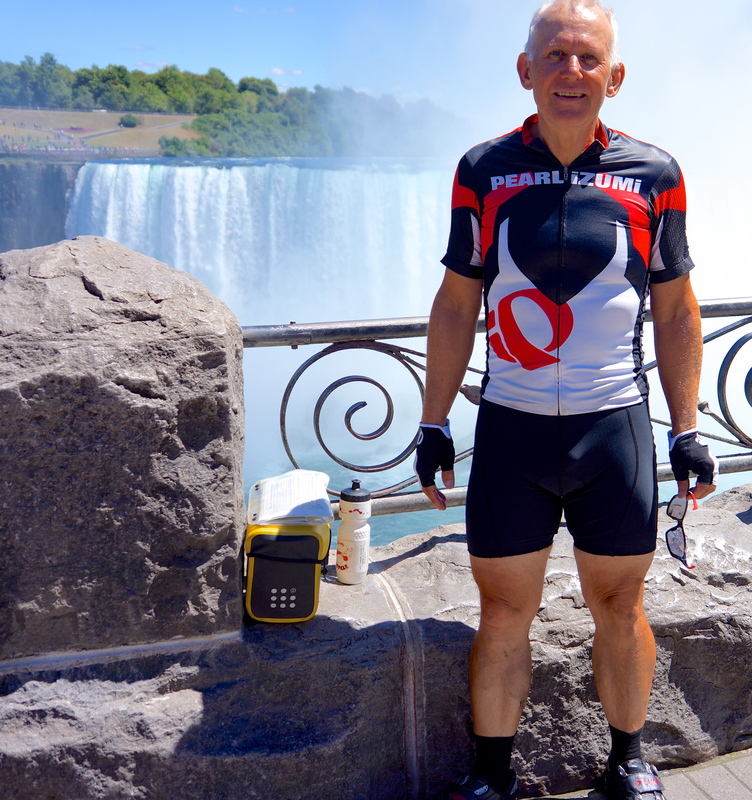 Mile 58: Photo documentation of Doug at Niagara Falls, Canada. Mile 58: View of Bridal Veil Falls, the smallest of the three falls that make up Niagara Falls. Mile 59: Another view of Bridal Veil Falls. Note the US extended lookout platform on the left top part of the photo. 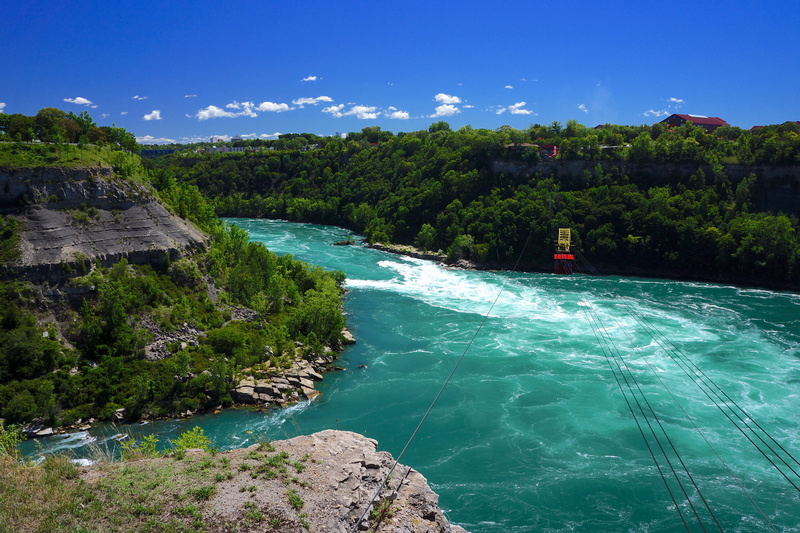 Mile 61: View of Whirlpool Gorge and the cable car that is suspended from six cables and traverses the width of the gorge at almost 1 kilometer (.6 miles) in length. 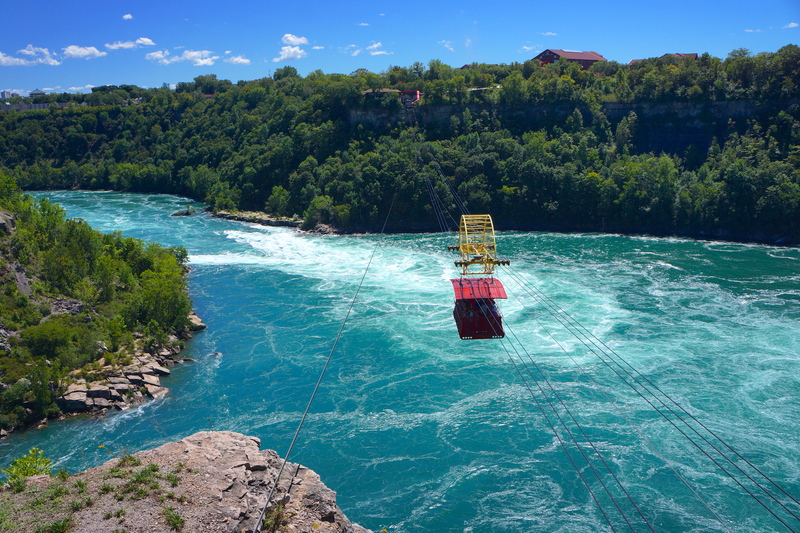 MIle 61: Another view of the Whirlpool Gorge and cable car. Sunset view at the waterfront in Lewiston, NY. This entry was posted on August 8, 2012 by Steve. It was filed under Photograph of the Day . 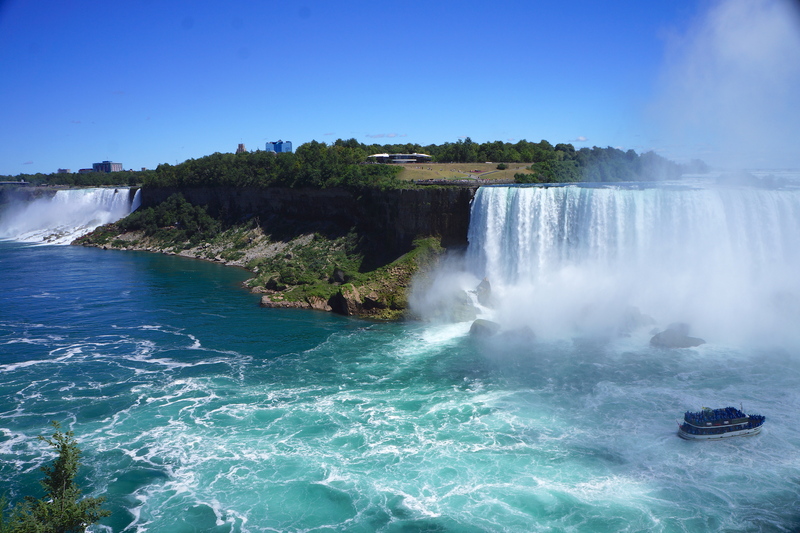 Fantastic photos of Niagra Falls! We look forward to seeing you when you reach Ticonderoga. Pedal safely. Steve, great photos on a lovely day, you look great, what an accomplishment!